In June-July 2019, residents will be able to move into their new homes in Majakka, the first tower building of the REDI complex. 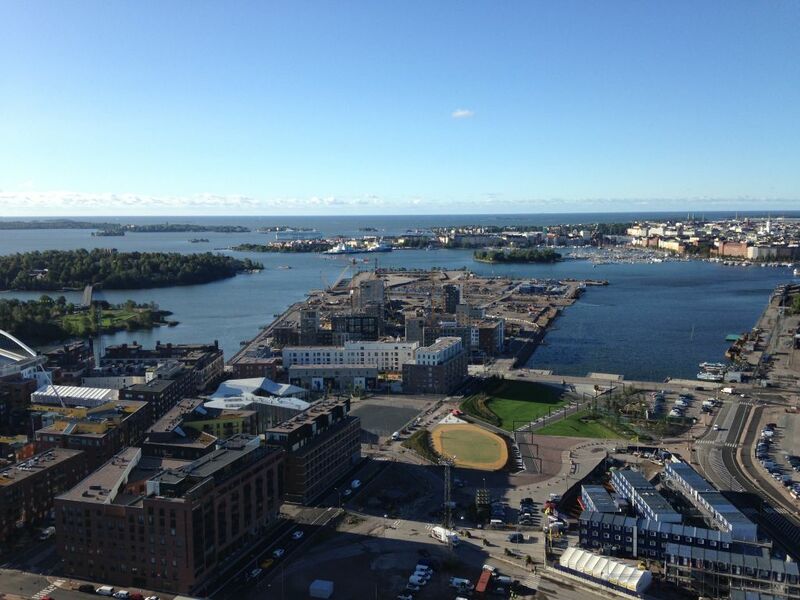 REDI, consisting of eight tower buildings and a shopping centre, is being implemented by SRV in Kalasatama, Helsinki. At the beginning of the project, Majakka’s estimated completion time was May 2019. Implementing such a large-scale project requires that we monitor carefully our schedules. The need to adjust the timetable has resulted from, among other things, façade installations, which were halted in the summer due to shortcomings perceived in façade elements by SRV’s own quality control. Due to careful analysis, undertaken in cooperation with experts from VTT Technical Research Centre of Finland, and successful corrective measures, the installations are once again under way. 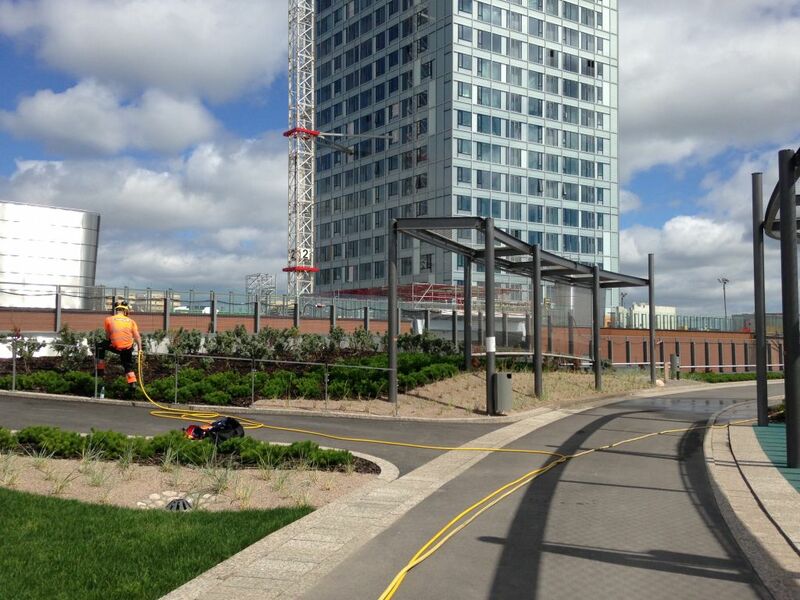 Windy conditions during the autumn have also adversely affected crane work to some extent. The longer than usual moving-in time required by this unique project has also been taken into account in the updated timetable. When it is completed, Majakka, which will reach a height of 134 metres, will be Finland’s tallest residential building. The interior architect-designed apartments and the versatile club premises on the 33rd floor, with magnificent views, offer wonderful landscapes and homes, every square metre of which has been designed for efficiency and comfort. REDI is the inner city’s most interesting destination. The tower buildings rising in the area and the inner city’s most experiential shopping centre form an unprecedented complex. In Finland, REDI is an exceptional and unprecedented construction project. In REDI, we are building a significant project in terms of the cityscape and from an urban development perspective. REDI is being built at a significant transport node and at a location above Kalasatama metro station, where utilisation of public transport is easier than anywhere else in Finland. With the shopping centre now open, visitors can access the third floor of the centre direct from the metro platform. Via the metro, the entire southern rail transport network is easily within reach. By metro, the journey from Kalasatama to Tapiola in Espoo takes only 20 minutes. In the REDI complex, special features of the construction include eight remarkably high tower buildings, integrated with a 64,000 square metre shopping centre, and a challenging location at the intersection of the metro and highways running into the city. At the same time as tower construction is advancing upwards from the roof level of the shopping centre, the shopping centre itself is functioning below. REDI is not simply about tower buildings but also the construction of a whole new city district. Kalasatama’s high-rise tower buildings, an environment that supports community spirit, good transport links and easily accessible services are a significant part of new kind of cityscape. The construction project’s unique location at the centre of a vibrant city has created for the construction both opportunities and challenges. At the same time as we are building Finland’s tallest residential tower, we are also taking housing services to a new level. With smart solutions facilitating everyday life, we can offer a quality way of living with a high level of convenience. In REDI, services are close at hand and easily accessible. From the apartments, residents need only take a lift ride down, and the shopping centre and its services are all there to enjoy. In REDI, housing and services are integrated in a way that has never been seen in Finland before. We are continually developing services in collaboration with REDI shopping centre operators in order to offer tower residents convenience and assistance in everyday living. A lobby attendant will serve Majakka’s residents in the main entrance lobby. The lobby attendant will, for example, advise in the use of joint services, guide visitors and help out in managing everyday issues. Receiving and sending packages will be facilitated by Posti package lockers situated on the 5th floor. Among the building’s smart systems is a display-equipped door phone, which you can use to order a lift and save on waiting time during the morning rush. Just as easily, you can let visitors inside, in which case the lift is automatically directed to the lobby to greet them. The construction of the REDI complex will continue for a long time. The overall construction timetable will extend to 2023. “Due to its scope, the REDI project has an exceptionally long overall timetable. In long projects, adjusting timetables can sometimes be considered necessary,” says SRV’s Antero Nuutinen, Senior Vice President, Housing in Finland. Work on Majakka has advanced well. 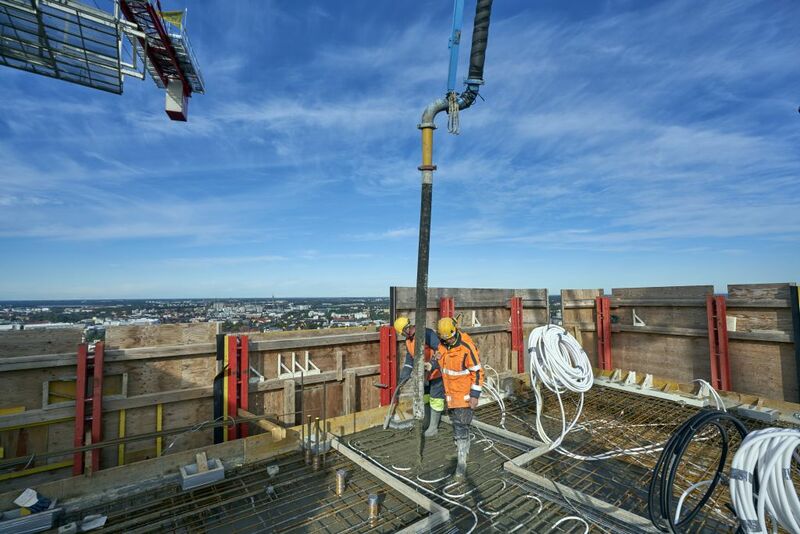 At the end of September, a significant milestone was reached in the construction of Majakka when we cast the floor of uppermost 35th storey of the building. Majakka is therefore now almost at its rooftop height. The installation of the uppermost storey’s steel structures is currently under way. Although we have been enjoying some fine autumn weather, there have been several windy days in the last couple of weeks, which meant that the cranes could not lift the façade elements. 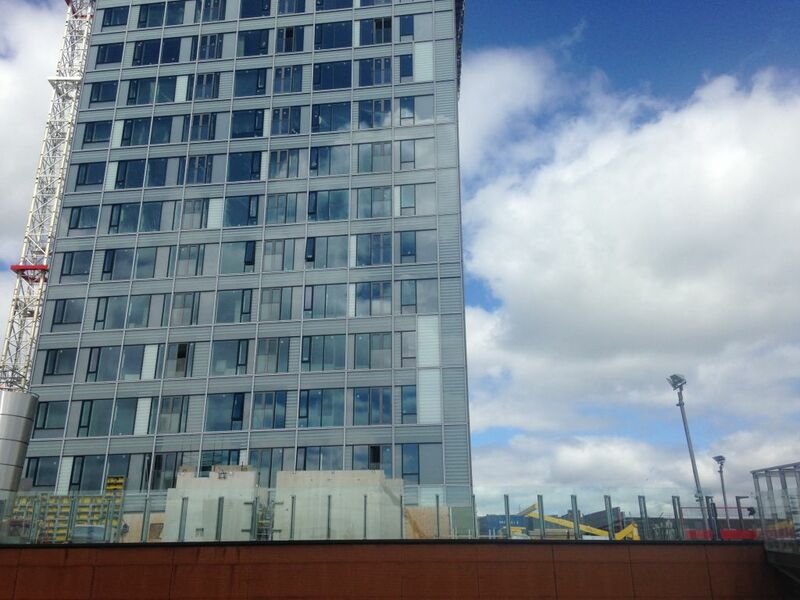 During the next few weeks, our target is to install the façade elements on the 20th-26th floors. Elements have now been installed up to the 25th floor. The first elements of the complex, the REDI shopping centre and a 2,000-space parking facility, opened on schedule in September 2018. REDI is located at the heart of one of Finland’s most strongly developing areas. Construction will continue for nearly two decades, and in 2040 the area will have 25,000 residents and 10,000 jobs. REDI shopping centre, which opened next to Finland’s mostly densely populated area, has around 60,000 people living in its direct proximity, and there are over 500,000 people, a third of the residents of Greater Helsinki, in its entire area of influence. REDI is located at the intersection of three large highways, and the metro stops 500 times a day on the third floor of the shopping centre. A number of bus lines stop both on the third floor of the shopping centre and at street level. 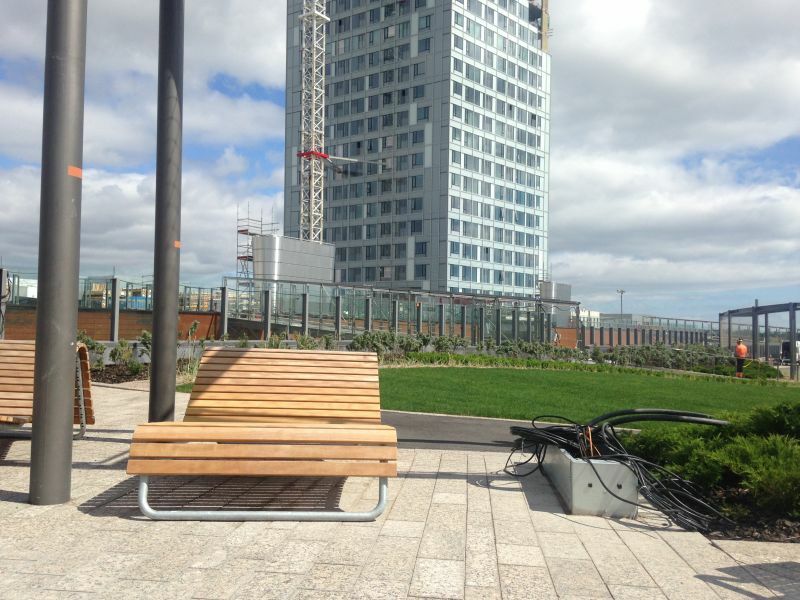 There are 45,000 jobs within a ten-minute walk of the centre. REDI and its towers form a construction complex in the middle of Kalasatama, which will utilise the smart energy solutions of the future. A smart area also requires smart solutions for its properties. As a responsible developer of urban centres, we support the goals set for the Kalasatama area by the City of Helsinki. A smart energy system in also being built for Kalasatama, enabling, for example, demand flexibility and local renewable electricity production. In accordance with the objectives for the area, REDI’s eight tower buildings will also feature ecologically-oriented technical systems. The residential apartments will incorporate as standard smart-home central units, which will enable smart control of the home, such control and metering of lighting or power sockets. The smart-home central units and apartment-specific meters will also help measure and illustrate for residents the apartments’ electricity and water consumption. In addition, apartments with saunas have been installed with control relays to enable power limitation of sauna heaters in order to implement electricity demand flexibility.